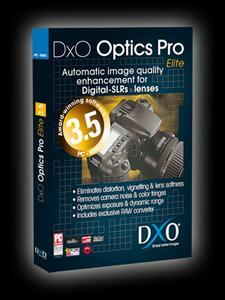 DxO Optics Pro automatically enhances images produced by Digital-SLR, advanced Digicams, and their lenses with revolutionary optics, noise and lighting corrections packed in an all-new, easy-to-use feature rich application. By eliminating compromises usually associated with camera and lenses (aperture vs. sharpness, focal range vs. distortion, image field vs. vignetting…), DxO Optics Pro opens up new worlds of possibilities to your photography. Finally you can have optimal performance at any setting. For example, DxO Noise Engine enables you to set higher ISO (up to 2 stops) while not increasing the noise level. This translates into more flexibility at capture since a higher shutter speed can be selected to reduce motion blur, or a smaller aperture can be chosen to increase the depth of field. The uniqueness of DxO Optics Pro lies in its ability to perform the highest quality corrections without human intervention. Whether you want to enhance your pictures in a single click without having to bother setting up sliders, or you want to manually set up your own correction parameters, you will find an operating mode ("fully automatic", "key controls" or "expert controls") that meets your needs. DxO Optics Pro is a robust, full batch solution that will save you hours and help you get the most out of your photographs. You can create batches of hundreds of images to process. JPEG and Raw files from different cameras and lenses can be mixed in the same batch.